It’s that time again! It’s time to help the less fortunate have a happy holiday season. By donating what you can to Peter and Paul Community Services, Webster will host a holiday party for the poor and homeless this month at the Peter and Paul Center, 8th and Allen in Soulard, St. Louis. At the holiday dinner, we hope to give each one of our guests a pair of new socks. 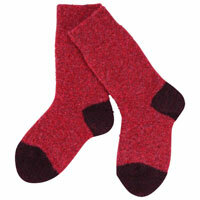 New sock donations of a pair (or more) are being accepted in the Nursing Department, Webster Hall room 200. Thanks again for ALL you do in support of Sts. Peter & Paul throughout the year! Contact Mary Ann Drake, MSN Program coordinator, Nursing Department, at drakema@webster.edu or 314-968-7482 with any questions about donations.